This soup is very much a staple here (along with the Minestrone) and since it looks like I've started to come down with a bit of a cold- I decided that it was time to cook up a pot (which we are eating leftovers of today..Delish!). One thing that I love about soups, is that they are so flexible, as far as quantities go, so use what you have. I think you'll find that you probably already have most ingredients on hand. I made this soup up, so I am giving approximates on quantities, if you only have 1 or 2 carrots, it's fine. I actually didn't have any celery last night and the soup still turned out great. Fill a small/medium saucepan with water and bring to a boil. Add chicken & boil 8-9 minutes until cooked throughout. Set aside to cool. In a large stock pot over medium heat, add 1-2 Tbsp of Olive Oil. Add the diced onion & sautee until translucent, about 5 minutes. If the onion looks like it's starting to burn, you can add a small ammount of chicken stock to the onions. Once the onions are cooked, add the garlic, celery & carrots and cook for another 5 minutes. Add the remaining chicken stock and bring to a boil. Add the noodles & reduce heat to simmer. Simmer for 10 minutes. Add chicken and dill and simmer another 5 minutes. Sometimes at this point (depending on how many carrots/celery/pasta, etc., I've added) I may need to add additonal stock, a few more cups because the soup is too thick and I want it a little more brothy. Either way- it's flexible so you can cater it to your own taste buds. 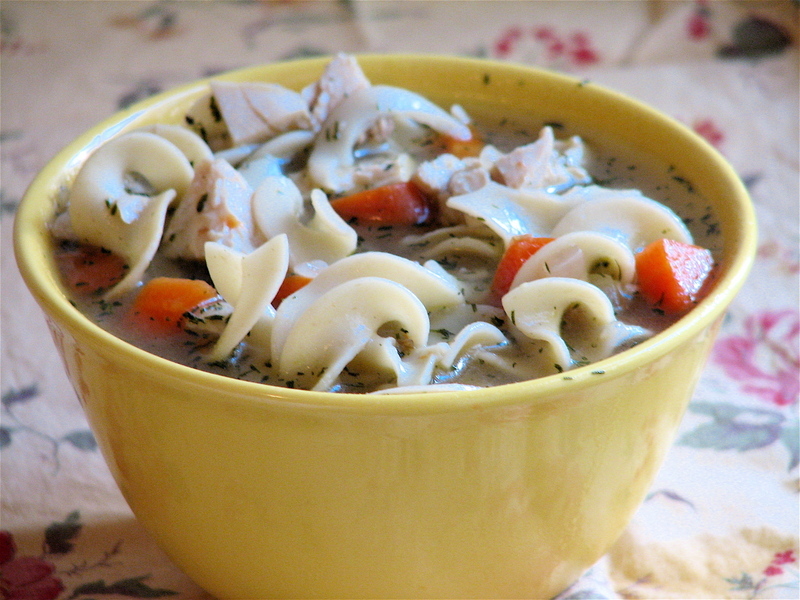 If you have extra soup and decide to eat it as leftovers, you many need to add additional chicken stock as the noodles will have absorbed some of the liquid.